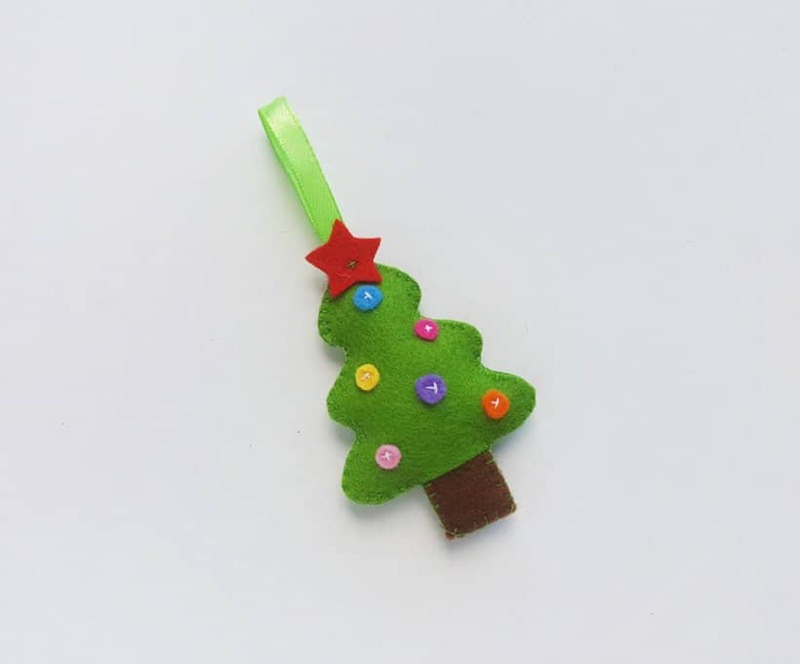 Most years my children and I spend quite a bit of time sewing new felt Christmas tree ornaments. They are often part of our gift wrap strategy each year. A simply wrapped gift box with minimalistic wrapping paper and ribbon, tied with a handmade felt Christmas tree ornament is a lovely way to gift wrap. 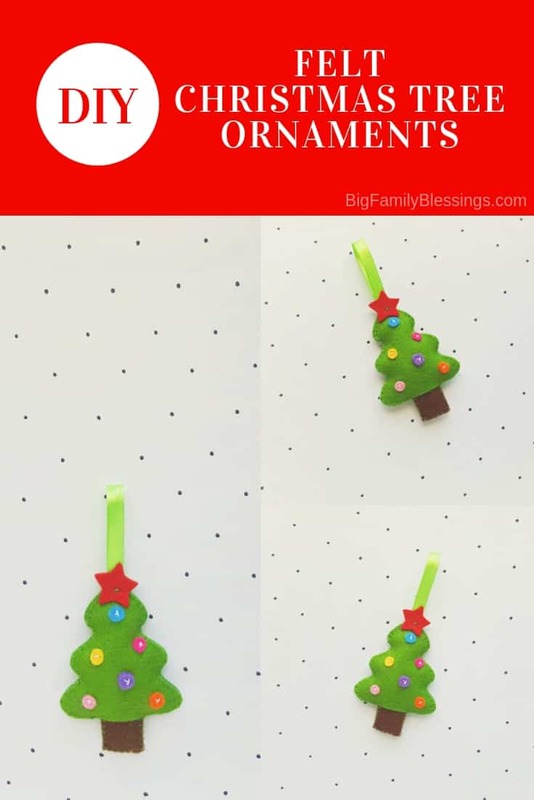 After gift giving is done, your ornament can be placed on the receiver’s tree each year. 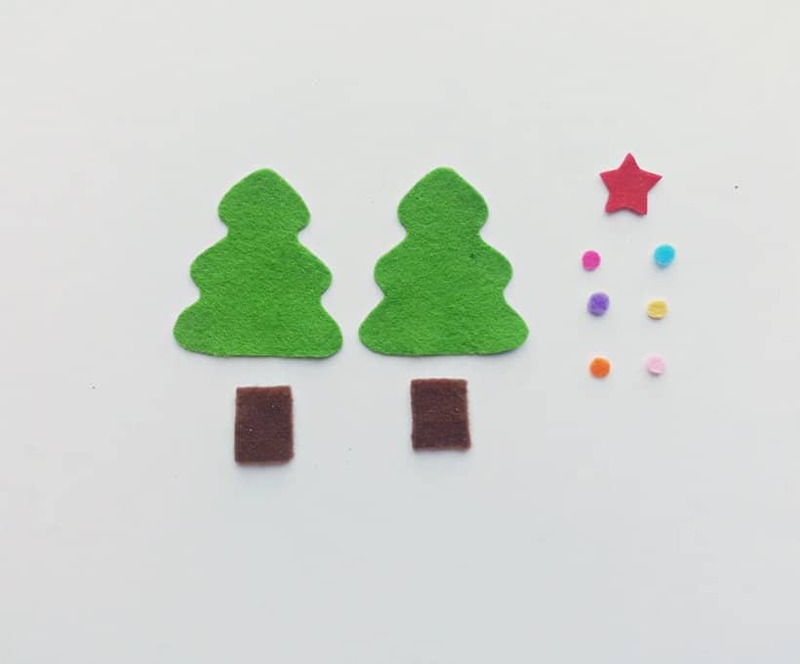 This year we are making these adorable DIY Felt Christmas Tree Ornaments. 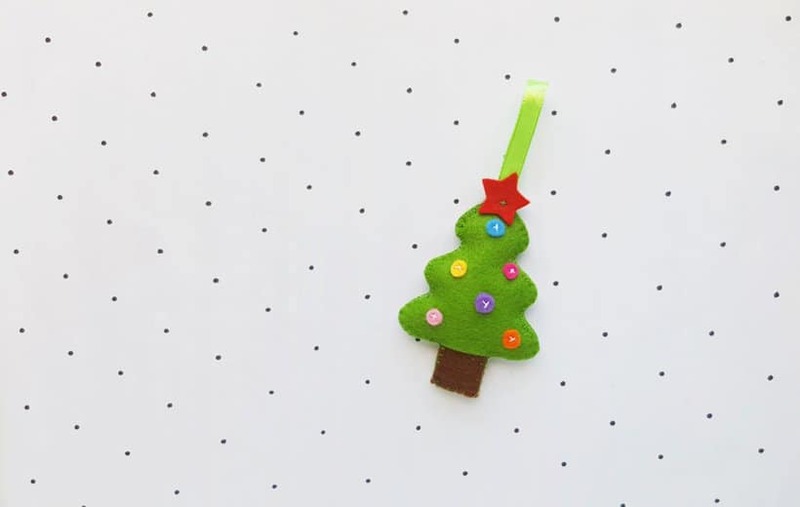 Felt, stuffing, and thread are about all you’ll need for this adorable Christmas craft activity. 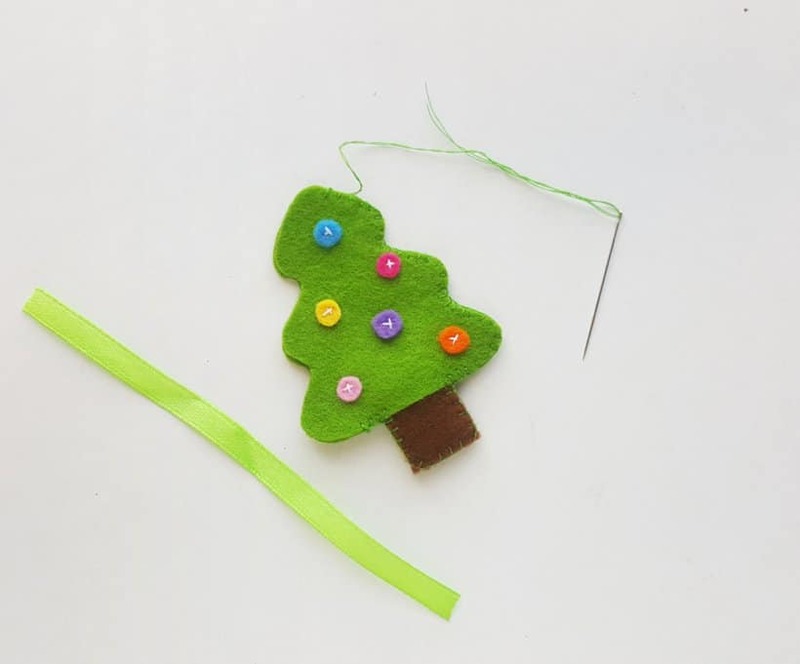 I usually start my kids on simple felt ornaments around 5 or 6 years old, and by 8 they can make ornaments like this Christmas tree all by themselves! In fact, our school room floor is currently covered in felt pieces and little people sewing various ornaments! Print the template, cut out the pieces, and select felt fabrics for each piece. Trace the template patterns on the felt and cut them out. Take one of the tree patterns and the small round shapes. 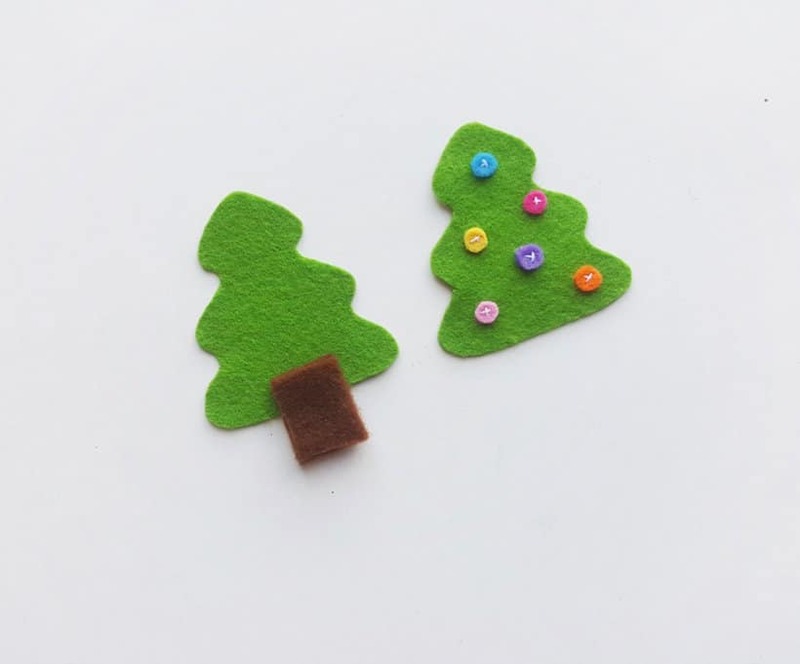 Prepare needle and thread and stitch the round felt pieces onto the tree pattern. 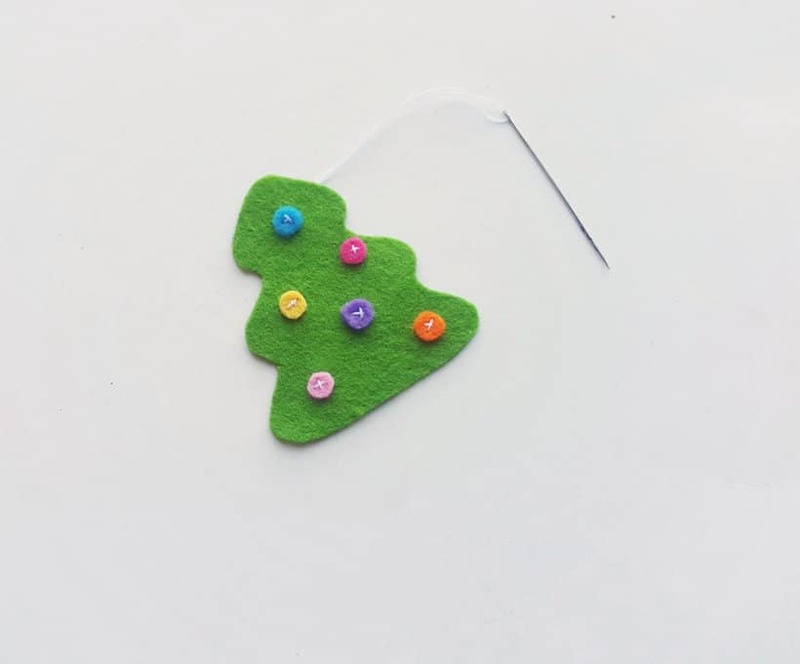 We do a simple cross stitch to attach each round cut outs on the tree pattern. Stitch all the round cut outs on to the tree. Feel free to add other shapes or more round pieces if you want. 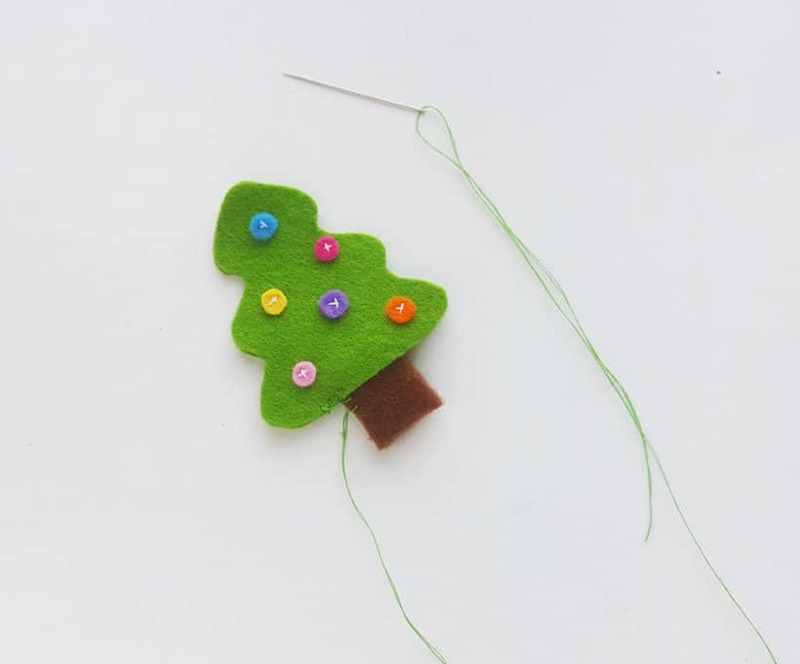 Tie a knot on the side of the tree pattern and cut off extra thread once the stitching is done. 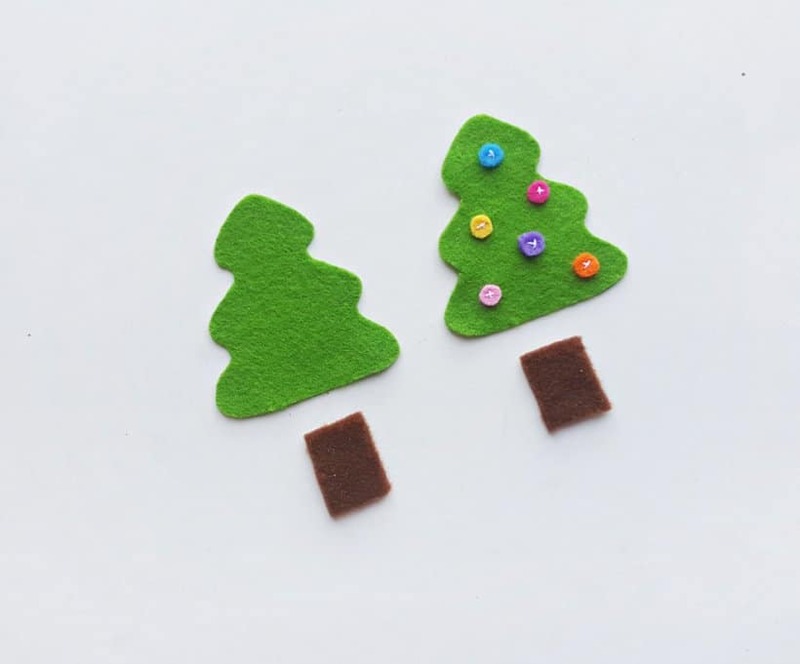 Place the plain tree, the stitched tree piece and the 2 brown square pieces on a flat surface. Hold the square pieces together and place them on the bottom middle part of the plain tree, by overlapping just a little of the squares with the tree. Now place the stitched tree pattern on the top of the plain one, making sure that all sides of the two tree patterns are matched nicely. Start to stitch from the bottom side. 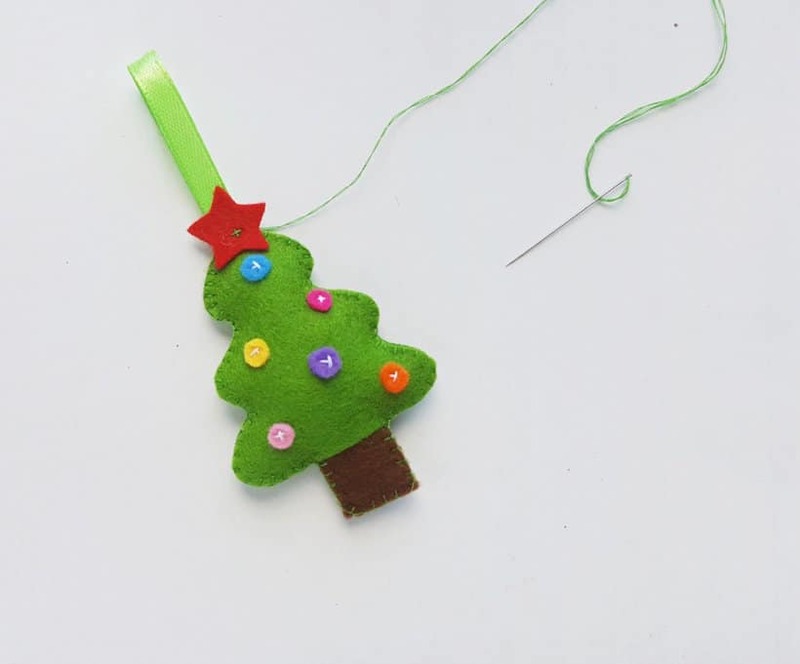 Stop stitching right before reaching the top end of the tree. 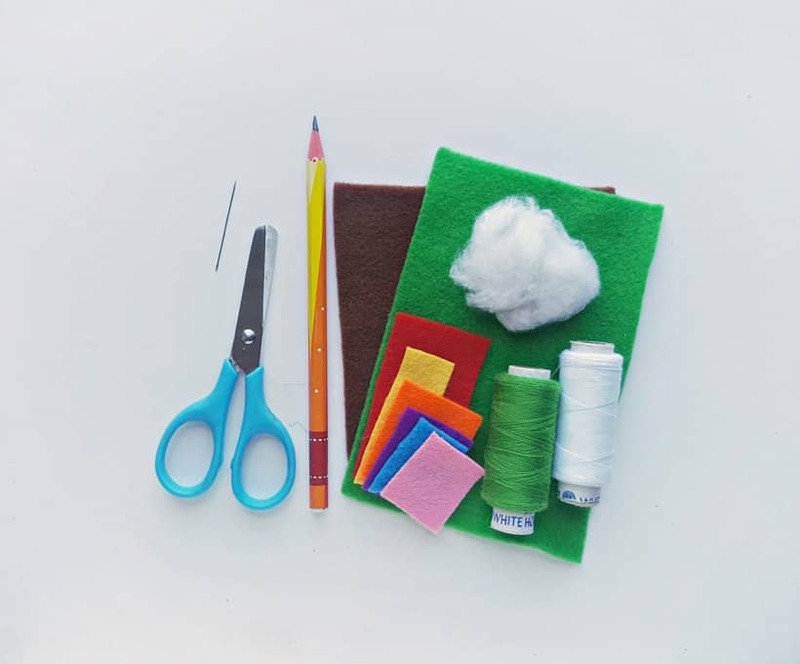 Cut a small piece of ribbon or a felt strip and fold it in half. 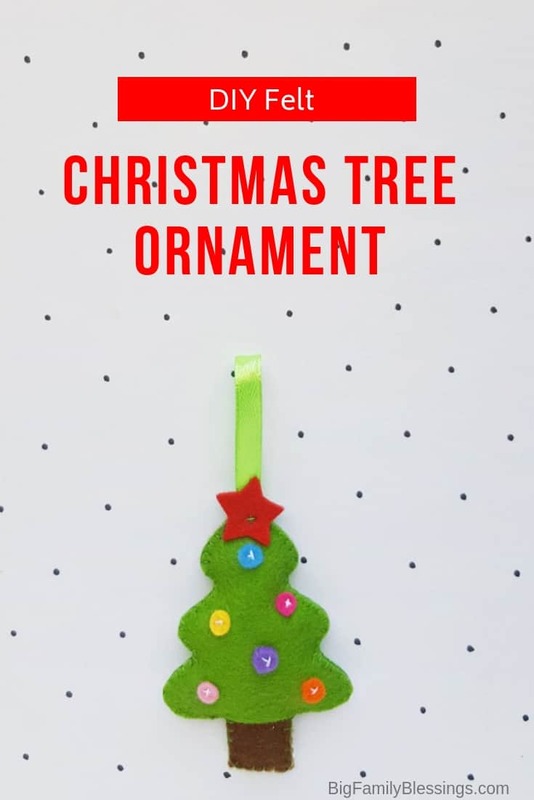 Place just a little of the folded ribbon or felt strip’s open ends between the tree pattern’s top end. Continue to stitch around the ornament. 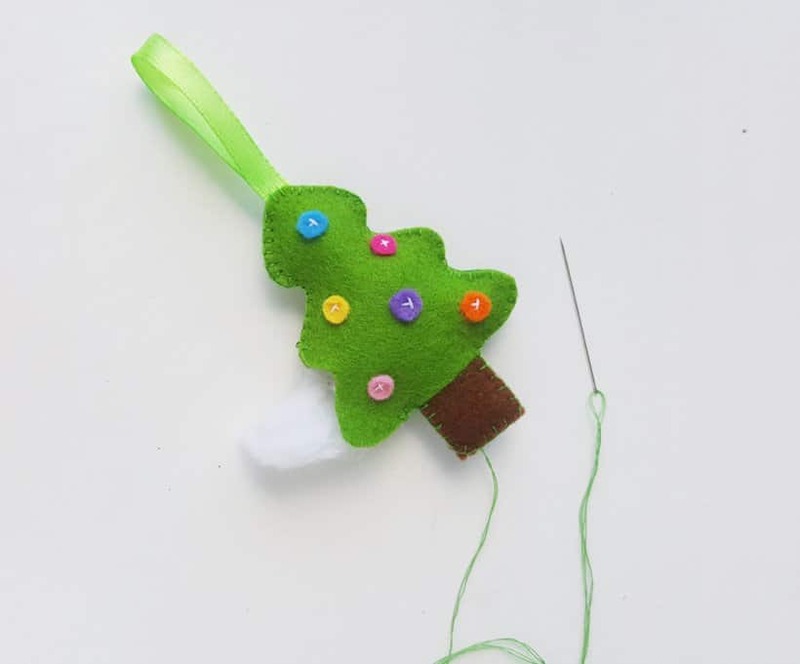 Before closing the ornament keep a small opening for stuffing the tree. 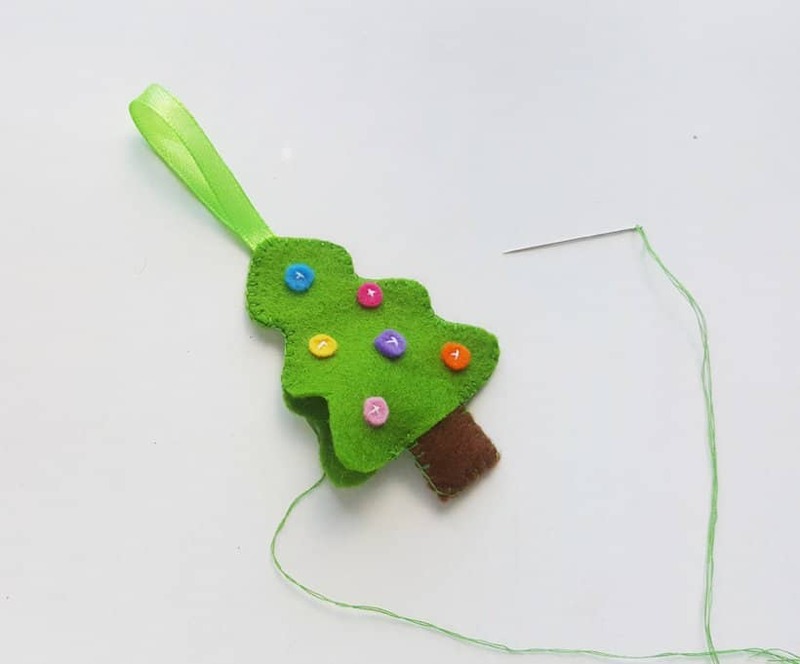 Use cotton and stuff the tree through the small open end. Stitch the ornament shut to secure the stuffing. Tie a few knots and then cut off the extra thread. 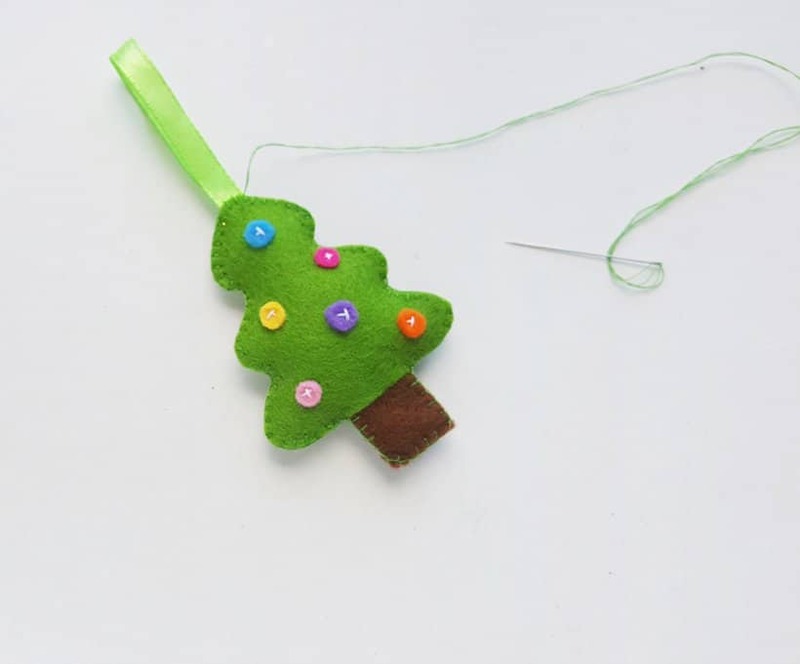 Place the star cut out on the top end of the tree and do a cross stitch to attach it to the tree. Tie a knot and cut off extra thread. All done! Not too difficult, right? My kids loved making them! 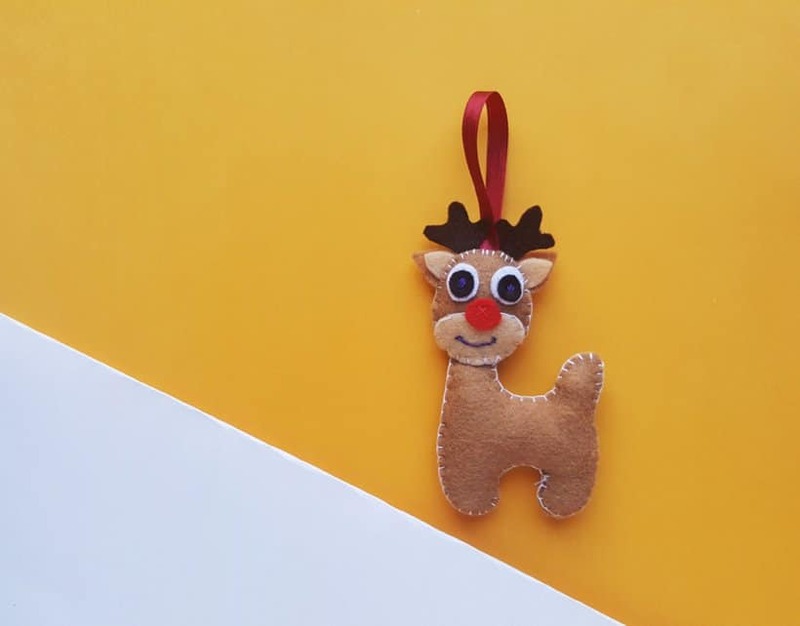 If you enjoyed this ornament you might also want to make these Felt Reindeer Ornaments too!